We explain what symmetry is and how primary-school children are taught to find the line of symmetry and draw lines of symmetry on different shapes. Something is symmetrical when it is the same on both sides. A shape has symmetry if a central dividing line (a mirror line) can be drawn on it, to show that both sides of the shape are exactly the same. In Year 4, children are asked to identify lines of symmetry in 2D shapes presented in different orientations. 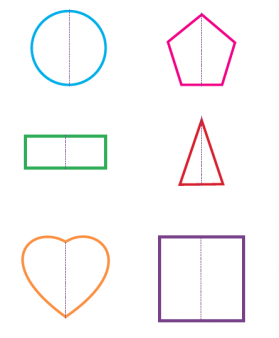 They will need to become aware that shapes have more than one line of symmetry. They may be asked to look at these regular shapes and think about how many lines of symmetry they can find. Again, it is helpful for them to cut out the shapes and fold them in half, then look at how many folds they have made. 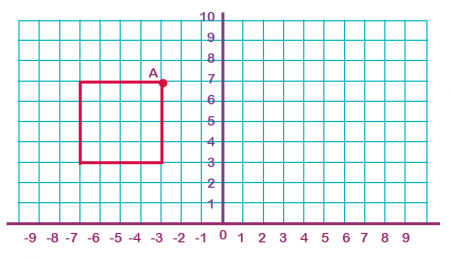 In Year 6 children will be asked to draw shapes on the co-ordinate plane and then reflect them in the axes so that they appear in all four quadrants (see below). Sometimes symmetry is combined with coordinates. A child may be shown a shape as follows and then asked to reflect it in the mirror line and then write down the co-ordinates of 'A' on the reflected shape (in the example below the reflected A vertex would have the coordinates 3, 7).